Thanksgiving is a time to reflect on all of the people, occasions, and things for which you are thankful. With this in mind, I want to reach out to readers of The Finer Things, and let you all know just how thankful I am for you. Since I began writing for The Finer Things this past spring, I have been overwhelmed with the creativity, sincerity and fun I see and read about in the blogosphere every day. I’m so grateful that I have the opportunity to share entertaining ideas, stationery trends, fashion finds, and so much more through The Finer Things. I’m even more thankful for the readers who make it a point to stop by daily, weekly or monthly to see what’s happening on this blog. Whether this is your 500th time or 1st time visiting The Finer Things, I appreciate each and every one of you! The comments you leave really make my day, and I am so flattered when an idea (or image board) is re-posted or stimulates new conversations. The atmosphere in the office of FineStationery.com is warm and welcoming. We come together every week, not only as co-workers, but as friends. I feel that same dynamic when I am blogging to all of you, as your blogs and comments generate such an amazing, inspiring and friendly atmosphere. I learn something new every day, and am lucky to be a part of the blogging community. So, whether you have your own blog, enjoy reading others’ blogs, comment, or just silently admire, I thank you for making this part of my job so very rewarding. 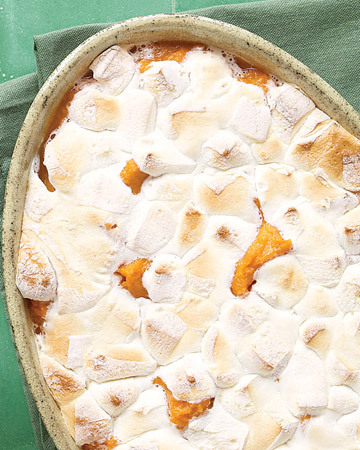 On a fun and festive note, I’d like to leave you with a little Thanksgiving treat – the recipe to one of my favorite Thanksgiving dishes, Sweet Potato Casserole! If you haven’t quite decided on your side dishes for tomorrow’s feast, you’ll love the easy recipe for this tasty treat!